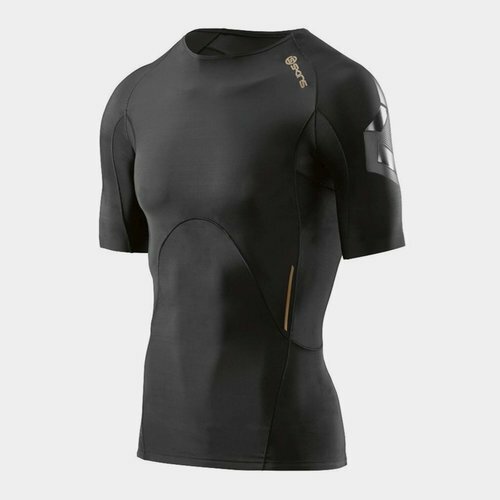 Perform better and recover faster with innovative technology featured in SKINS A400 Mens Compression S/S Top. Developed and even re-developed to meet the demands of a body in movement, the top has been lightly constructed from nylon and elastane. With the added benefit of mesh inserts under the arms, this is a welcome fresh touch for increased breathability. It's all very well having the features but if the comfort lets you down then you just won't wear the kit. That's why SKINS have incorporated A-Seams and bonded hems for maximum durability but without the annoying chafing so you are left to focus on your performance in supreme comfort. ADAPTIVE Technology even keeps you warm when it's cold and cool when it's hot so you are always at a comfortable temperature during any activity. No one likes their top riding up so to combat this annoying little problem, SKINS have included a silicone insert wrapped around the inside of the waist so it stays in place even during extreme movements.